A small harvest guarantees a great year! The professionals won’t forget the 2012 vintage year anytime soon! The weather conditions were such that they were able to roll-out all their know-how. Alsace had a fresh but mostly wet winter and spring. These conditions lasted until the end of June, associated with very low temperatures recorded in May which greatly delayed the flowering. So it lasted a long time and was incredibly irregular, therefore resulting in the phenomena of coulure and shot berries. From the onset of summer, a decrease in the harvest volume and a late picking-time was predictable. The months of July and August were marked by very high heat causing a lack of water in certain places. The few rains during August allowed the vines to catch-up a little on its lateness. Fortunately, the hail episodes reported around Colmar had very little effect. In September, the vines were in an overall good state of health. The initially high acidities decreased but still remained favourable to the wine vivacity. It should be noted that at the start of harvest time, the region was lucky to have – for once! – ideal weather conditions with sun, mild temperatures and cool nights. Harvest time wasn’t easy! They had to be organised according to the weather conditions (rainy period at the beginning of October), and per parcel, checking the evolving ripeness and the grape health, without even really taking the various grape varieties into account. On September 19 for AOC Crémant d’Alsace. 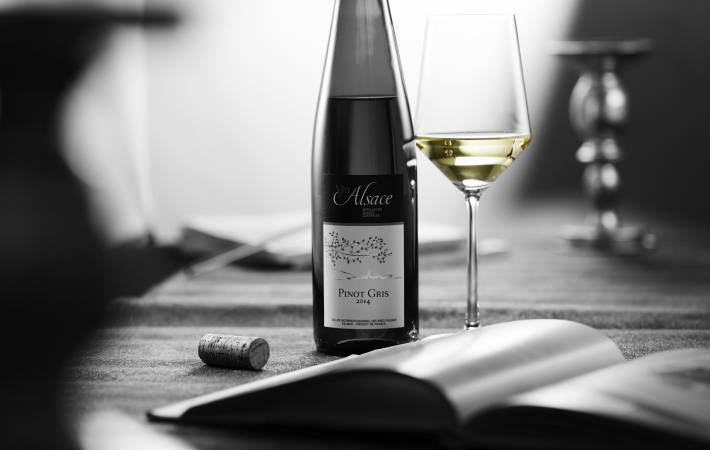 For AOC Alsace: on September 30 for all the varieties but on October 7 for Riesling and Gewurztraminer. For AOC Alsace Grands Crus: on September 30 for all the lieux-dits and all the varieties (unless otherwise requested by certain Local Managements) but October 7 for Riesling and Gewurztraminer. October 14 for the Vendanges Tardives and Sélections de Grains Nobles. Considering the milder climatic conditions reported during the second half of October and the overall low yield recorded, the production of Vendanges Tardives and Sélections de Grains Nobles was incredibly limited with a total volume of 3817 hl (down to over 60% compared to 2012). The overall harvest for 2013 showed a volume, including all the AOCs, of 976,115 hl down to 12.9% compared to 2012. It’s broken down with 697,839 hl of AOC Alsace (of which 32,245 hl of Communal and Lieux-Dits), 38,026 hl of AOC Alsace Grands Crus and 240,250 hl of AOC Crémant d’Alsace. Crémants d’Alsace make-up the major successful part of this vintage year with Pinot Blanc being the major grape variety used for these sparkling wines. It also produced some excellent still wines, balanced and generous in fruit. Pinot Gris and Gewurztraminer are particularly fresh with controlled alcohol levels and therefore great balance, completely suited for gourmet occasions. Pinot Noir is well-coloured with a great balance of tannins and acidity. Sylvaner is light and crispy. If Muscat is very typical, the volume remains low due to coulure. The harvest conditions were more complicated for Riesling. They were picked later and suffered from rainy conditions. Fortunately, the fact the vine growth-rate was controlled, once again proved to be essential to guarantee the quality. So in the end, wines with ripe fruit and white flower notes on the nose and a palate of delicious flavours along with very chiselled acidity.